Hey Terry. 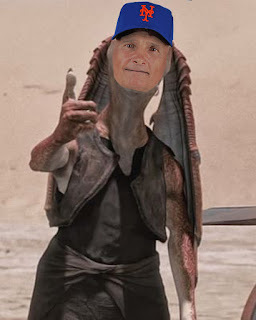 I just wanted to thank you for your time here with the Mets as a fan. You were a professional and really wanted the best for the team and the fans. From what I could tell you put your heart and soul into managing this team. I think you wanted this to be your redemption after what happened on the West Coast when you last managed a team. I think you did well to endear a lot of folks and when fans were saying it's time to go it wasn't because you were a bad overall manager but a manager that baffled us with some of he way you used your players. Hey Player A, I know you have been tearing it up for weeks and really seem to be coming into your own, so I'm going to bench you tomorrow because you seem like you are ready to be tired and are going to need a rest. Hey Player B, I know you have been colder then the iceberg who wrecked the Titanic but I think you are about to break through, so I am going to put you the fourth hole for game for of the World Series. Hey Player C, I think it's time for you to go in for your 5th game pitching straight for one batter and now I am going to switch you with Player D for a batter then Player E for two batters so he can give up three runs. What I am trying to say is that your in game managing left a lot to be desired and baffled the hell out of me. I still can't explain some of the moves you pulled with line ups and with your "gut feelings" in game. Even with that, I want you to know that I and quite a few Mets fans appreciate what you have done for the team and Mets fans over the years.